Tomorrow marks the start of Dietitians of Canada’s Nutrition Month with this year’s inspiring theme being Unlock the Potential of Food. While food and nutrition regularly make headlines as to the latest research on what may help prevent various ills, there are so many aspects to the potential of food that we have simply forgotten about. While wholesome food provides an abundance of nutrients, healthy eats can offer so much more. It’s a source of fuel, something so many often don’t give a thought to – in the way that we don’t think of a cause and effect of how we feel through the day after eating. I can’t tell you how often I’ve heard from individuals that I’m counselling for various issues in my office, who, after eating regularly through the day, ask me about what it is that they’re doing that could make them feel so good. They think that there is some magical combination that has resulted in their suddenly having so much more energy. No magic pills or supplements. When I say that is simply the right foods offer fuel, they are actually really surprised. With all the talk about nutrition and healthy eating, somehow that basic concept of fuel has been lost. Running on empty truly can make you feel lethargic. There’s no point in looking for some magical cure or supplement in your pharmacy or health food store. Eating well does offer its perks – even on a daily basis. Food is also about pleasure-the sensory gratification it provides but also about the tradition and memories associated with various dishes and meals. Food brings people together to share those pleasures and camaraderie. But again, this is something we seem to be losing sight of. Instead too many of us are eating on the run or opting for a meal replacement-a bar or a liquid meal in a can – instead of nourishing ourselves with real food. We now look to a bottle of supplements or powder to provide nutrients instead of real food. We debate various nutrients, such as fats and carbohydrates, and which are best to avoid for easier waist management. And again, the value of wholesome food is, all too often, an afterthought. In a recent study, published in the Journal of the America Medical Association, scientists assessed the impact of low-fat versus low-carbohydrate diets on weight loss in more than 600 subjects over the period of a year. The researchers also looked at various genetic factors to see which eating pattern combined with genes led to greater weight loss. Now before going into the results, I want to point out that this study was different than many others in that both eating patterns included more whole foods – whole grains, fruits and vegetables and the like. Many other studies have looked at the impact of these eating patterns but have included refined grains and added sugars. In this study, both groups were instructed to go for healthier options. The results? There was no significant difference between the two eating patterns. In other words, healthy eats win. Over the span of Nutrition Month, I’ll cover a whole range of topics on how to unlock the real potential of food. 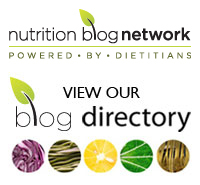 In the meantime, check out the Nutrition Month website for healthy living tips, nutritious (and delicious) recipes and helpful links – including one that helps Canadians find a dietitian in their area.